OLD PARKED CARS. 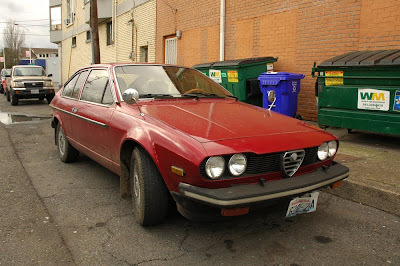 : 1978 Alfa Romeo Alfetta GTV. 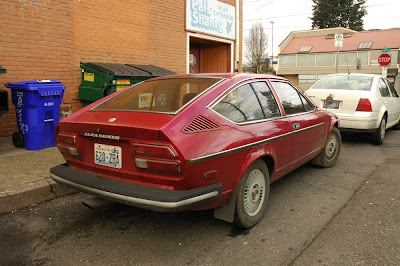 1978 Alfa Romeo Alfetta GTV. Such a bent up plate! I love this car... it's not a Guiletta, but you can't have everything. BTW: got your link off the TTAC site and you've been filling the void of Paul Neidermeyer's absence. what a find, and brilliantly shot. i want to drink that ambient light with a straw. having seen less than a handful of these, I'm always struck by the length of the tail. fastback profile is almost a shooting brake. don't know if I've ever had the privilege of witnessing the exhaust note in person, but just getting to inspect one parked is pretty satisfying in its own way. shooting this must have been so fun. I do something similar so I'm looking for some advice. Here is one of my sets. 1. How do people typically react if they discover you shooting? I often shoot from my car or stop very briefly. Ever ask for permission if a car is parked outside a house? 2. I've found that most interesting cars tend to be parked in shadier areas of town. Ever run into any problems? I tend to shoot from my car and avoid shooting if people are around. Again amazing finds and some great photography. There is a GTV6 on campus and it sounds pretty sweet when/if it's running. I know the owner has some sort of troubles with it. Still a great looking car. One of Alfa's sexiest designs, for sure. 1. i think ben gas knocked on people's doors before, if he gets a good vibe, but in general no--sniper mission, in and out, better to ask forgiveness than permission. if someone does appear, i engage them immediately and enthusiastically. people are generally confused and suspicious at first, then feel better when they see how sincerely psyched we are. 2. be bold, and be quick. i would only shoot from my car in the rarest of situations. if i can't get an optimal picture due to an obstruction or bad lighting, i'll make a mental note and try to catch the car another time. I rarely have time to get roped into conversations these days, so I really only knock if I'll need to be stepping far into a yard or driveway. This car was absolutely awesome to find, I don't get to see enough fender mirrors. The slope of that hatchback curving into a little spoiler was just gorgeous. The craftsman ship on that Alfa font was stunning. Even the VIN tag under the front window had Italian style, I had to shoot it. I don't think I've ever asked people. I do sniper missions (mostly drive-bys). The problem with getting out is that the neighborhoods I tend to find lots of car are rough. You can often do quite a bit from the car by circling the block or pulling into driveways or parking lots and backing out again. I often scout if I'm unsure and approach from different angles. Also in Oklahoma City a lot of cars are parked in driveways and not on the street making things more challenging. Worse, they are often park front in making the shot uninteresting unless you get out and walk into the driveway (and that exposes you quite a bit). Plus nobody really walks here so any person is suspicious. The good thing about OKC is that there are LOTS of interesting cars especially American products. I use evernote on my iPad to record cars I want to shoot that were difficult for some reason. I've thought about trying to shoot more when people are not around i.e. during work hours (my job is flexible), when it rains, is cold, super hot or early in the mornings on Sunday. Trying to avoid encounters as much as possible. Final comment. How to you guys nail down the year of the car that precisely? Sometimes I can't tell the exact year even after doing research. I can always narrow it down, but sometimes not to one year. I am not sure if this is a Sprint Veloce. The Sprint Veloce was made by Alfasud. This mode I think is a GTV. 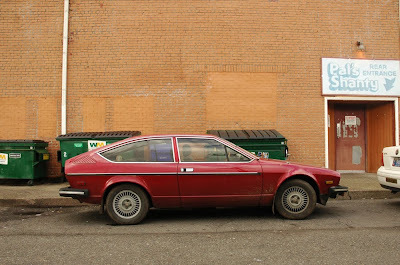 Well it's hard to be certain without talking to the owner, but for 77-78 I think it was only called the Sprint Veloce. Tor, those are good questions. I think the research gets easier and easier by noticing the subtle differences that differentiate years, but we also get a lot of helpful comments from more knowledgable OPC viewers. Thanks for the comment. 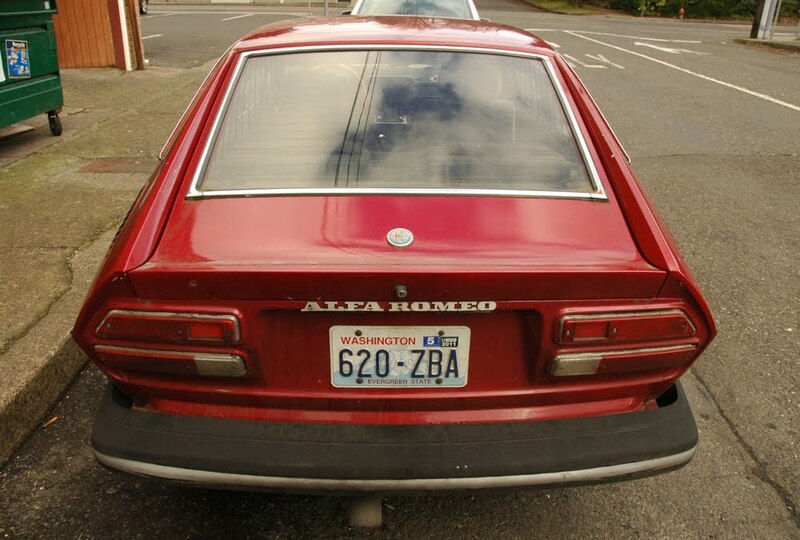 I swear when I was researching the car, Wikipedia said that this briefly had the Sprint Veloce name in the late 70s. It seems that has been removed from the page now, so I'm definitely thinking you're right. How'd you find our blog? Wow, I was just browsing the internet and come across a photoset of my car! That's awesome. It is actually a '79, it is a Sprint Veloce, and she is still running strong!